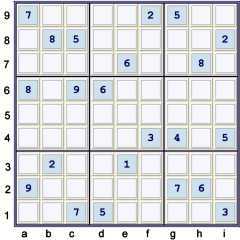 The following is an illustrated proof for the Tough Sudoku of April 8, 2007. 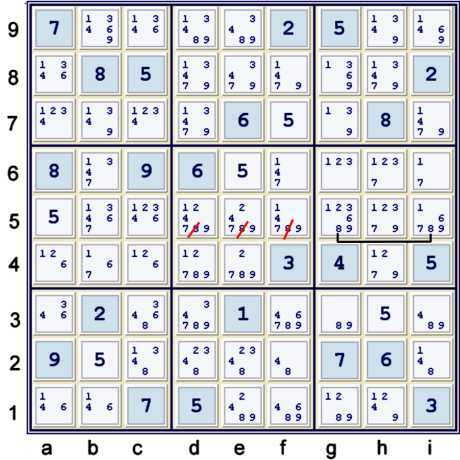 The main techniques that I used to solve this puzzle are forbidding chains, which are called at most sudoku sites Alternating Inference Chains (AIC). Happy Easter to everyone! I would feel guilty publishing a blog page on Easter Sunday, but it is only Saturday at my location on this orb. One can solve all the fives. Although there are many steps available after the Unique Possibilities, this proof will only illustrate the steps this proof needs. Although I only show a few steps here, the search for more complex techniques usually begins for me only after exhausting the easy stuff. After solving the puzzle, to make the proof as short as possible, I can easily see which of the steps that I found were not required. Above, the 8s in box h5 are limited to only gi5. 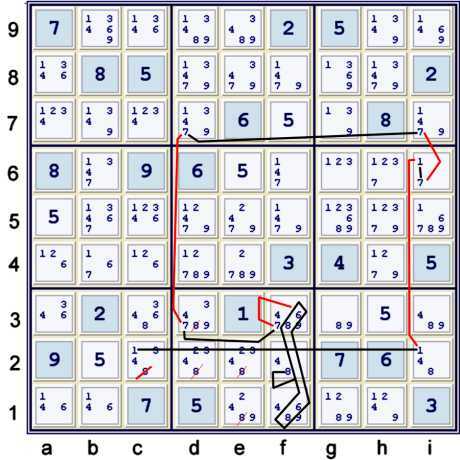 Since gi5 exists in row 5, the possible 8s in row 5 and outside of box h5 cannot exist. You may note that there is a hidden pair 68 at gi5. I did not need the hidden pair in this proof, but there are other proofs possible that would likely use this hidden pair. The beginning of such an alternate path will be placed at the end of this proof. The latter eliminations are just a reflection of being efficient, and generally I would have made those eliminations first. f2=8 or f13 is restrained to only candidates 6,8 as there would be only 2 locations left for both 6,8 in column f.
To convince yourself of the validity of the elimination, see what happens to the sets indicated on the illustration if c2=8. Feel free to ask me if you cannot follow the logic, as I may detail it better when I have more time. This chain is not hard to find, as it considers some of the same strong inferences used in the previous chain. It is probably not the shortest chain possible to unlock this puzzle, but it does the trick nonetheless. 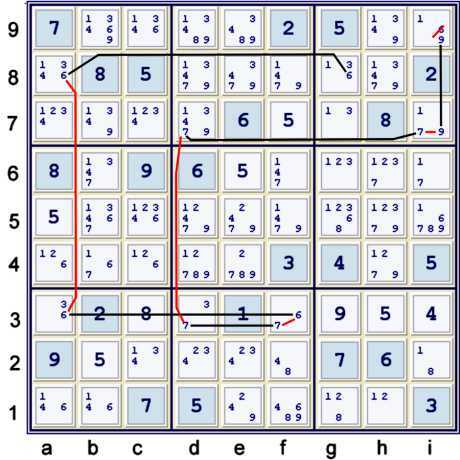 After eliminating the 6 from i9, the puzzle is reduced to a cascade of Hidden and Naked singles (Unique Possibilities) to the end. Rating: .01 + .63 + .31 = .95, high rating due to one long step! Now, perhaps a depth 3 or depth 4 chain(s) and some locked candidates, maybe a pair depending on path, can unlock the puzzle. I would love to see alternative proofs for this one, as I am certain that better ones are possible than the one illustrated above. 1) Start at 22 filled. Unique possibilities to(UP) 27. 2c) locked 2's at de2, forbid e1=2. I always enjoy alternate paths!